​Camacho-Morles, J., Slemp, G. R., Oades, L. G., Pekrun, R., & Morrish, L. (2019). Relative Incidence and Origins of Achievement Emotions in Computer-Based Collaborative Problem-Solving: A Control-Value Approach. Computers in Human Behavior. Camacho-Morles, J., Slemp, G. R., Oades, L. G., Morrish, L., & Scoular, C. (2019). The role of achievement emotions in the collaborative problem-solving performance of adolescents. Learning and Individual Differences, 70, 169-181. Low, B. C., Lim, K., Wong, M., Ooi, S., Oades, L. G., & Yap, C. K. (2019). Stages of recovery from depression in relation to clinical outcomes and consumer recovery processes. International Journal Of Community Medicine And Public Health, 6(3), 910-919. Dulagil, A., Spence, G., & Oades, L. (2018, December). Context is king! The importance of organisational climate in facilitating strengths use in workplaces. In Australian Psychologist, 53, 23-23. Green, L. S., Oades, L. G., & Robinson, P. L. (2012). Positive education programmes: Integrating coaching and positive psychology in schools. Coaching in education: Getting better results for students, educators, and parents, 115-132. Magee, C., Gordon, R., Robinson, L., Caputi, P., & Oades, L. (2017). Workplace bullying and absenteeism: The mediating roles of poor health and work engagement. Human Resource Management Journal, 27(3), 319-334. Oades, L. G., & Johnston, A. L. (2017). Wellbeing Literacy: The Necessary Ingredient in Positive Education. Child Dev, 82(1), 405-432. Slemp, G. R., Chin, T. C., Kern, M. L., Siokou, C., Loton, D., Oades, L. G., ... & Waters, L. (2017). 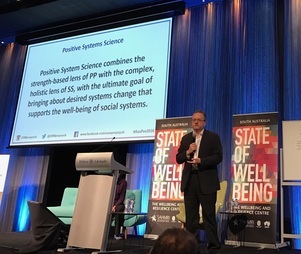 Positive education in Australia: Practice, measurement, and future directions. In Social and Emotional Learning in Australia and the Asia-Pacific (pp. 101-122). Springer, Singapore. Williams, V., Deane, F. P., Oades, L. G., Crowe, T. P., Ciarrochi, J., & Andresen, R. (2016). A cluster-randomised controlled trial of values-based training to promote autonomously held recovery values in mental health workers. Implementation Science, 11(1), 1. Williams, V. C., Deane, F. P., Oades, L. G., Crowe, T. P., Ciarrochi, J., & Andresen, R. (2016). Enhancing recovery orientation within mental health services: Expanding the utility of values. The Journal of Mental Health Training, Education and Practice, 11(1), 23-32. Click here. Le Boutillier, C., Slade, M., Lawrence, V., Bird, V. J., Chandler, R., Farkas, M., ... & Shepherd, G. (2015). Competing priorities: staff perspectives on supporting recovery. Administration and Policy in Mental Health and Mental Health Services Research, 42(4), 429-438. Click here. Slade, M., Bird, V., Le Boutillier, C., Farkas, M., Grey, B., Larsen, J., ... & Williams, J. (2015). Development of the REFOCUS intervention to increase mental health team support for personal recovery. The British Journal of Psychiatry, 207(6), 544-550. Click here. Magee, C., Gordon, R., Robinson, L., Reis, S., Caputi, P., & Oades, L. (2015). Distinct workplace bullying experiences and sleep quality: A person-centred approach. Personality and Individual Differences, 87, 200-205. Click here. Robinson, P., Oades, L., & Caputi, P. (2015). Conceptualising and measuring mental fitness: A Delphi study. International Journal of Wellbeing, 5(1). Click here. Martin, L. S., Oades, L. G., & Caputi, P. (2015). Clients' experiences of intentional personality change coaching. International Coaching Psychology Review. 10(1), 94-108. Click here. Veage, S., Ciarrochi, J., Deane, F. P., Andresen, R., Oades, L. G., & Crowe, T. P. (2014). Value congruence, importance and success and in the workplace: Links with well-being and burnout amongst mental health practitioners. Journal of Contextual Behavioral Science, 3(4), 258-264. Click here. Passmore, J., & Oades, L. G. (2014). Positive psychology coaching - A model for coaching practice. Coaching Psychologist, 10(2). Passmore, J., & Oades, L. G. (2014). Positive psychology techniques - Active constructive responding. Coaching Psychologist, 10(2). Deane, F. P., Andresen, R., Crowe, T. P., Oades, L. G., Ciarrochi, J., & Williams, V. (2014). A comparison of two coaching approaches to enhance implementation of a recovery-oriented service model. Administration and Policy in Mental Health and Mental Health Services Research, 41(5), 660-667. Click here. Martin, L. S., Oades, L. G., & Caputi, P. (2014). A step-wise process of intentional personality change coaching. International Coaching Psychology Review, 9(2), 181-195. Click here. Martin, L. S., Oades, L. G., & Caputi, P. (2014). Intentional personality change coaching: A randomised controlled trial of participant selected personality facet change using the Five-Factor Model of Personality. In 4th International Congress of Coaching Psychology 2014 (Vol. 9, No. 2, p. 196). Click here. Siqueira, V. R., & Oades, L. G. (2014). Experiential avoidance and psychological acceptance processes in the psychological recovery from enduring mental illness. International Journal of Psychosocial Rehabilitation. Click here. Vella, S. A., Oades, L. G., & Crowe, T. P. (2013). The relationship between coach leadership, the coach–athlete relationship, team success, and the positive developmental experiences of adolescent soccer players. Physical education and sport pedagogy, 18(5), 549-561. Click here. Vella, S., Crowe, T., & Oades, L. (2013). Increasing the effectiveness of formal coach education: Evidence of a parallel process. International Journal of Sports Science and Coaching, 8(2), 417-430. Click here. Vella, S., Oades, L., & Crowe, T. (2013). A pilot test of transformational leadership training for sports coaches: Impact on the developmental experiences of adolescent athletes. International Journal of Sports Science and Coaching, 8(3), 513-530. Click here. Andresen, R., Caputi, P., & Oades, L. (2013). Development of a short measure of psychological recovery in serious mental illness: the STORI-30. Australasian Psychiatry, 21(3), 267-270. Click here. Williams, V., Oades, L. G., Deane, F. P., Crowe, T. P., Ciarrochi, J., & Andresen, R. (2013). Improving implementation of evidence-based practice in mental health service delivery: protocol for a cluster randomised quasi-experimental investigation of staff-focused values interventions. Implementation Science, 8(1), 1. Click here. Kerr, D. J., Crowe, T. P., & Oades, L. G. (2013). The reconstruction of narrative identity during mental health recovery: A complex adaptive systems perspective. Psychiatric rehabilitation journal, 36(2), 108-109. Click here. Smith, I. P., Oades, L., & McCarthy, G. (2013). The Australian Corporate Closet, Why It's Still So Full: A Review of Incidence Rates for Sexual Orientation Discrimination and Gender Identity Discrimination in the Workplace. Gay and Lesbian Issues and Psychology Review, 9(1), 51-63. Click here. Sun, B. J., Deane, F., Crowe, T., Andresen, R., Oades, L. G., & Ciarrochi, J. (2013). A preliminary exploration of the working allliance and 'real relationship' in two coaching approaches with mental health workers. Click here. Andrew, C. L., Smith, D., Sampson, J., Oades, L., & Spence, G. (2013). Changing workplace habits: from lunch a-la-desk to meetings on the run: a pilot initiative at the University of Wollongong, NSW. Australian Occupational Therapy Journal, 60(1), 80-81. Click here. Martin, L. S., Oades, L. G., & Caputi, P. (2013). Rejoiner. What is personality change coaching and why is it important? A response to Martin, Oades & Caputi. International Coaching Psychology Review, 8(1), 74-67. Click here. Williams, J., Leamy, M., Bird, V., Harding, C., Larsen, J., Le Boutillier, C., ... & Slade, M. (2012). Measures of the recovery orientation of mental health services: systematic review. Social psychiatry and psychiatric epidemiology,47(11), 1827-1835. Click here. Bird, V. J., Le Boutillier, C., Leamy, M., Larsen, J., G Oades, L., Williams, J., & Slade, M. (2012). Assessing the strengths of mental health consumers: A systematic review. Psychological Assessment, 24(4), 1024-1033. Click here. Clarke, S., Oades, L. G., & Crowe, T. P. (2012). Recovery in mental health: a movement towards well-being and meaning in contrast to an avoidance of symptoms. Psychiatric Rehabilitation Journal, 35(4), 297-304. Click here. Smith, I. P., Oades, L., & McCarthy, G. (2012). Homophobia to heterosexism: Constructs in need of re-visitation. Gay and Lesbian Issues and Psychology Review, 8(1), 34-44. Click here. Oades, L. G., & Anderson, J. (2012). Recovery in Australia: Marshalling strengths and living values. International Review of Psychiatry, 24(1), 5-10. Click here. Vella, S. A., Oades, L. G., & Crowe, T. P. (2012). Validation of the differentiated transformational leadership inventory as a measure of coach leadership in youth soccer. Sport Psychologist, 26(2), 207-223. Click here. Coulson, J. C., Oades, L. G., & Stoyles, G. J. (2012). Parents’ subjective sense of calling in childrearing: Measurement, development and initial findings. The Journal of Positive Psychology, 7(2), 83-94. Click here. Martin, L. S., Oades, L. G., & Caputi, P. (2012). What is personality change coaching and why is it important? International Coaching Psychology Review, 7(2), 185-193. Click here. Vella, S. A., Oades, L. G., & Crowe, T. P. (2012). A coach-centred evaluation of the effectiveness of a transformational leadership training program for youth sport coaches. International Journal of Sports Science and Coaching. Vella, S. A., Oades, L. G., & Crowe, T. P. (2012). The impact of coach transformational leadership training on the development experiences of adolescent athletes. Journal of Applied Sport Psychology. Stefanic, N., Caputi, P., Iverson, D. C., Lane, L. G., & Oades, L. G. (2012). Investigating resilience in breast cancer: a mixed-methods approach. Asia-Pacific Journal Of Clinical Oncology, 8(3) 295. Click here. Stefanic, N., Caputi, P., Iverson, D., Oades, L., & Lane, L. (2012). Applying a goal-based resilience model to breast cancer: A preliminary study. Psychology and Health, 27 (Supplement 1: "Resilience and Health": 26th Conference of the European Psychology Society), 124-124. Click here. Oades, L. G., Robinson, P., Green, S., & Spence, G. B. (2011). Towards a positive university. The Journal of Positive Psychology, 6(6), 432-439. Click here. ​Spence, G. B., & Oades, L. G. (2011). Coaching with self-determination theory in mind: Using theory to advance evidence-based coaching practice. International Journal of Evidence Based Coaching and Mentoring, 9(2), 37-55. Click here. Oades, L. G., Robinson, P., & Green, S. (2011). Positive education: Creating flourishing students, staff and schools. InPsych: The Bulletin of the Australian Psychological Society Ltd, 33(2), 16. Click here. Crowe, T. P., Oades, L. G., Deane, F. P., Ciarrochi, J., & Willliams, V. C. (2011). Parallel processes in clinical supervision: Implications for coaching mental health practitioners. Click here. Copic, V., Deane, F. P., Crowe, T. P., & Oades, L. G. (2011). Hope, meaning and responsibility across stages of recovery for individuals living with an enduring mental illness. The Australian Journal of Rehabilitation Counselling,17(02), 61-73. Click here. Andresen, R., Oades, L. G., & Caputi, P. (2011). Measures of individual recovery. Australian and New Zealand Journal of Psychiatry, 45(10), 900-900. Click here. Oades, L., Walker, R., & Fisher, N. (2011). Staff wellbeing predicting positive attitudes towards mental health recovery. International Journal of Person Centered Medicine, 1(3), 564-573. Click here. Andresen, R., Oades, L., & Caputi, P. (2011). Reply to Trauer. Psychiatry Research, 186(2), 470. Click here. Vella, S. A., Oades, L. G., & Crowe, T. P. (2010). The application of coach leadership models to coaching practice: Current state and future directions. International Journal of Sports Science & Coaching, 5(3), 425-434. Click here. Uppal, S., Oades, L. G., Crowe, T. P., & Deane, F. P. (2010). Barriers to transfer of collaborative recovery training into Australian mental health services: implications for the development of evidence‐based services. Journal of Evaluation in Clinical Practice, 16(3), 451-455. Click here. Coulson, J., Oades, L., & Stoyles, G. (2010). Parent’s conception and experience of calling in child rearing: A qualitative analysis. Journal of Humanistic Psychology, 52(2), 222-247. Click here. Salgado, J. D., Deane, F. P., Crowe, T. P., & Oades, L. G. (2010). Hope and improvements in mental health service providers' recovery attitudes following training. Journal of Mental Health, 19(3), 243-248. Click here. Wolstencroft, K., Oades, L., Caputi, P., & Andresen, R. (2010). Development of a structured interview schedule to assess stage of psychological recovery from enduring mental illness. International Journal of Psychiatry in Clinical Practice, 14(3), 182-189. Click here. Mould, T. J., Oades, L. G., & Crowe, T. P. (2010). The use of metaphor for understanding and managing psychotic experiences: A systematic review. Journal of Mental Health, 19(3), 282-293. Click here. Oades, L. G., Law, J., & Marshall, S. L. (2011). Development of a consumer constructed scale to evaluate mental health service provision. Journal of evaluation in clinical practice, 17(6), 1102-1107. Click here. Deane, F. P., Crowe, T. P., Oades, L. G., Ciarrochi, J., Marshall, S., Williams, V., & Andresen, R. (2010). Facilitating the transfer of collaborative recovery training into clinical practice: Intervention and coaching protocols.Wollongong: Australia Illawarra Institute for Mental Health, University of Wollongong. Click here. Marshall, S. L., Oades, L. G., & Crowe, T. P. (2010). Australian mental health consumers' contributions to the evaluation and improvement of recovery oriented service provision. Israel Journal of Psychiatry and Related Sciences, 47(3), 198-205. Click here. Oades, L. (2010). The evidence for the benefits of happiness. Click here. SBS HDR Student Conference. Paper 17. Oades, L. G., Crowe, T. P., & Nguyen, M. (2009). Leadership coaching transforming mental health systems from the inside out: The Collaborative Recovery Model as person-centred strengths based coaching psychology. International Coaching Psychology Review, 4(1), 25-36. Click here. Clarke, S. P., Oades, L. G., Crowe, T. P., Caputi, P., & Deane, F. P. (2009). The role of symptom distress and goal attainment in promoting aspects of psychological recovery for consumers with enduring mental illness. Journal of Mental Health, 18(5), 389-397. Click here. ​Clarke, S. P., Crowe, T. P., Oades, L. G., & Deane, F. P. (2009). Do goal-setting interventions improve the quality of goals in mental health services?. Psychiatric Rehabilitation Journal, 32(4), 292-299. Click here. Marshall, S. L., Oades, L. G., & Crowe, T. P. (2009). Mental health consumers' perceptions of receiving recovery‐focused services. Journal of evaluation in clinical practice, 15(4), 654-659. Click here. Oades, L. G., & Crowe, T. P. (2008). Life Journey Enhancement Tools (Life JET). Click here. Marshall, S. L., Crowe, T. P., Oades, L. G., Deane, F. F., Psych, D. C., Kavanagh, D. J., & Psych, D. C. (2007). A review of consumer involvement in evaluations of case management: consistency with a recovery paradigm. Psychiatric Services. Click here. Oades, L. G., Crowe, T. P., & Deane, F. P. (2007). The Collaborative Recovery Model: moving beyond 'us and them' in mental health. Click here. Clarke, S. P., Oades, L. G., & Crowe, T. (2007). Recovery goals. What are the types of goals being established and at what stage within the recovery process. Click here. ​Andresen, R., Caputi, P., & Oades, L. (2006). Stages of recovery instrument: development of a measure of recovery from serious mental illness. Australian and New Zealand Journal of Psychiatry, 40(11-12), 972-980. Click here. Clarke, S. P., Oades, L. G., Crowe, T. P., & Deane, F. P. (2006). Collaborative goal technology: theory and practice. Psychiatric Rehabilitation Journal,30(2), 129. Click here. Deane, F. P., Crowe, T. P., King, R., Kavanagh, D. J., & Oades, L. G. (2006). Challenges in implementing evidence-based practice into mental health services. Australian Health Review, 30(3), 305-309. Click here. Malins, G., Oades, L., Viney, L., & Aspden, S. (2006). What's in a service? Consumers' views of Australian mental health services. Psychiatric Rehabilitation Journal, 29(3), 197-204. Click here. Kelly, P. J., Deane, F. P., Kazantzis, N., Crowe, T. P., & Oades, L. G. (2006). Use of homework by mental health case managers in the rehabilitation of persistent and recurring psychiatric disability. Journal of Mental Health, 15(1), 95-101. Click here. Malins, G., Morland, K., Strang, J., Dowson, T., Hunt, S., Williamson, D., ... & Oades, L. (2006). A framework for mental health consumers to evaluate service provision. Australasian Psychiatry, 14(3), 277-280. Click here. ​Crowe, T. P., Deane, F. P., Oades, L. G., Caputi, P., & Morland, K. G. (2006). Training recovery oriented mental health teams. Psychiatric Services, 57(10), 1497-1500. Click here. Oades, L., Deane, F., Crowe, T., Gordon Lambert, W., Kavanagh, D., & Lloyd, C. (2005). Collaborative recovery: an integrative model for working with individuals who experience chronic and recurring mental illness. Australasian Psychiatry, 13(3), 279-284. Click here. Deane, F. P., Glaser, N. M., Oades, L. G., & Kazantzis, N. (2005). Psychologists' use of homework assignments with clients who have schizophrenia. Clinical Psychologist, 9(1), 24-30. Click here. Marshall, S. L., Crowe, T. P., Oades, L. G., Deane, F. F., Psych, D. C., & Kavanagh, D. J. (2005). A Review of Consumer Involvement in Evaluations of Case Management: Consistency With a Recovery Paradigm. Methodology, (34). Click here. Bentley, C., Viney, L., & Oades, L. (2005). Identification of carers' standards for evaluation of public mental health services: A personal construct model. Australian Journal of Psychology 57, 2. Spence, G., Oades, L. G., & Caputi, P. (2004). Trait emotional intelligence and goal self-integration: important predictors of emotional well-being?. Personality and Individual Differences, 37(3), 449-461. Gonsalvez, C. J., Oades, L. G., & Freestone, J. (2002). The objectives approach to clinical supervision: Towards integration and empirical evaluation. Australian Psychologist, 37(1), 68-77. Click here. Buhler, Lindsay G Oades, Susan J Leicester, Carmen J Bensley, Allison M Fox, J. (2001). Effect of executive functioning on perceived needs in chronic schizophrenia. International journal of psychiatry in clinical practice, 5(2), 119-122. Click here. Caputi, P., & Oades, L. G. (2001). Epistemic assumptions: Understanding self and the world (a note on the relationship between identity style, world view, and constructivist assumptions using an Australian sample). Journal of Constructivist Psychology, 14(2), 127-134. Click here. Caputi, P., Oades, L. G., & Andresen, R. (2001). Reply to Bender [Letter]. Australian and New Zealand Journal of Psychiatry, 35(5), 691-692. Click here. ​Andresen, R., Caputi, P., & Oades, L. G. (2000). Interrater reliability of the Camberwell assessment of need short appraisal schedule. Australian and New Zealand Journal of Psychiatry, 34(5), 856-861. Click here. Glaser, N. M., Kazantzis, N., Deane, F. P., & Oades, L. G. (2000). Critical issues in using homework assignments within cognitive-behavioral therapy for schizophrenia. Journal of rational-emotive and cognitive-behavior therapy,18(4), 247-261. Click here. Balnaves, M., Caputi, P., & Oades, L. G. (2000). A theory of social action: Why personal construct theory needs a superpattern corollary. Journal of Constructivist Psychology, 13(2), 117-134. Click here. Viney, L. L., Truneckova, D., Weekes, P., & Oades, L. (1999). Personal construct group work for adolescent offenders: Dealing with their problematic meanings. Journal of Child and Adolescent Group Therapy, 9(4), 169-185. Click here. Viney, L. L., Truneckova, D., Weekes, P., & Oades, L. (1997). Personal construct group work with school-based adolescents: Reduction of risk-taking. Journal of Constructivist Psychology, 10(2), 167-186. Click here.